We all been there, that horrible moment when our pet's favorite toy rips! Poor Loki just stares at me with sad eyes and I rush to amazon to order him another one. There is no invincible toy, quote contrary to what some claim. 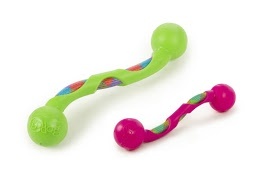 Loki has proven them wrong, but there is a few toys that are a bit tougher and can stand up to Loki's rough and tough play. 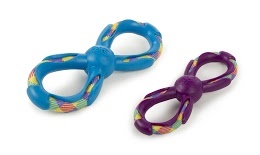 goDog® RopeTek™ combines the strength and durability of climbing rope with flexible TPR with new ThermaFuse Technology™ to produce a toy that is made to stand up to tough play! ThermaFuse Technology is an exciting NEW, patent-pending manufacturing process that fuses nylon climbing rope to a TPR surround that makes them more durable than standard rope toys. Loki can pull and tug all he wants, but this Rope Tek toys so far have held up!